POWER TO USE OVER AND OVER AGAIN. 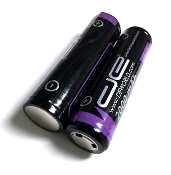 Use these rechargeable 18650 batteries in a variety of electronic devices. The DE two pack of flat top 18650 2000mAh, 3.7V, batteries will keep your device running like new. These li-on cells are perfect for electronics that require lots of power in a short period of time. The capacity of 18650cell is 2A. Max continuous discharge current is 2.5A.